All demolition works undertaken by a qualified and experienced demolition contractor are completed in a controlled environment. This ensures the safety of the demolition team, other contractors and stakeholders, and the surrounding general public. What is a Controlled Demolition? Generally speaking, the term ‘controlled demolition’ refers to the demolition of a building or structure by means of explosives. Demolition using explosives, sometimes called an implosion, ensures the strategic collapse of a building or structure by placing explosive materials in a pre-determined, detailed sequence and detonating them at a pre-arranged time. 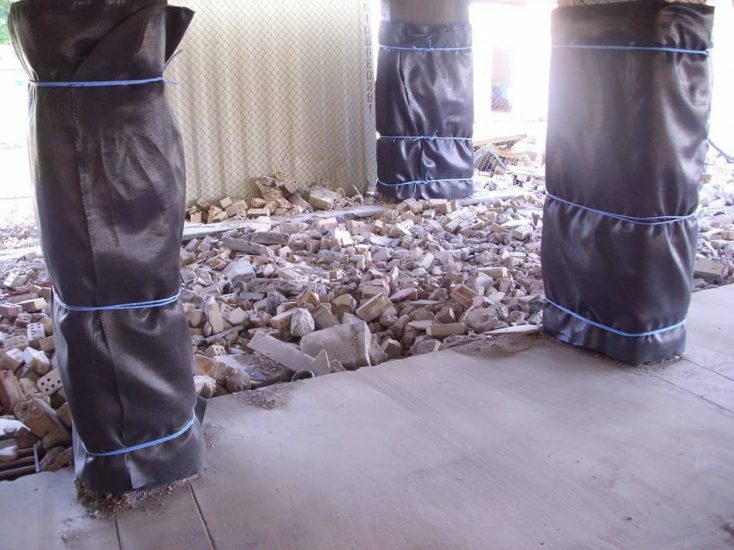 Site preparation for demolition is detailed and thorough, regardless of the method of demolition. When preparing a site for demolition by explosive means it all depends on the structure. A simple structure like a chimney can be prepared for a controlled demolition in less than a week but larger, more complex or multiple structures can take up to six months of preparation to remove internal walls, drilling holes for placing of explosives, wrapping columns with fabric and fencing before firing the explosives. Although using explosives as a method to demolish indicates that the building or structure will be ‘blown up’, this is not actually the case. Controlled demolition employs a serious of small explosions, strategically placed within a structure, progressively detonated encouraging a collapse by weakening or removing critical supports. Explosives on the lower floors then initiate a controlled collapse and the building fails under its own weight, succumbing to gravity. When is a Controlled Demolition used? 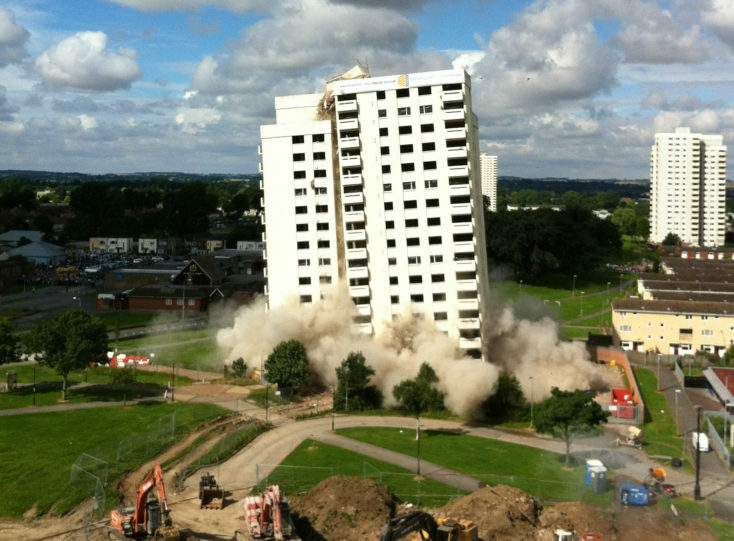 Controlled demolition can be used on virtually any type of structure but is commonly utilised on buildings of significant height, bridges, chimney stacks and cooling towers. Tall buildings, such as tower blocks, are typically seen as the main buildings demolished by controlled demolition. It is essentially more cost and time efficient in bring down a building of significant size and height to use explosives. But use of this method all depends on the surrounding area and whether there are other buildings in close proximity, and tenants and/or residents occupying those buildings. The local environment and wildlife is also taken into consideration. The demolition of bridges over in-use roadways and waterways by controlled demolition ensures minimum disruption to the general public and transportation systems. Road closures and waterway traffic halts are put in place for preparation, detonation, and debris clearing. Depending on the size of the bridge, clearing the debris can usually be completed in a matter of days so that diversions can be lifted. Hughes and Salvidge assisted other demolition companies in the demolition of a bridge over the M3 in November 2016. The collaborating teams worked 24/7 over a weekend to undertake the controlled demolition and debris clearing ready for the Monday morning rush hour. Chimney stacks and cooling towers are particular examples of structures that can pose higher safety concerns when demolishing, due to the way they are constructed. For these types of structures, controlled demolition is the quickest, safest and most economically viable method. Controlled demolition is also the focal point for the ‘demolition spectacle’ – demolishing a building of significance, with heritage, or an ‘eyesore’, drawing a crowd and press interest. The demolition of well-known stadiums – we utilised explosives when demolishing The Dell football stadium in Southampton, residential tower blocks – we demolished Bridgeman House in Hull by explosive means, and Las Vegas hotels – we haven’t ticked that one off the list yet – all fall into this category.